Category Archives: Do Your Chores! Posted by dandeliondaze in Do Your Chores! I have recently decided to try to start making some of my cleaning products at home. I don’t know why I waited so long to give it all a try. After all, it saves money and of course it is safer for my family. 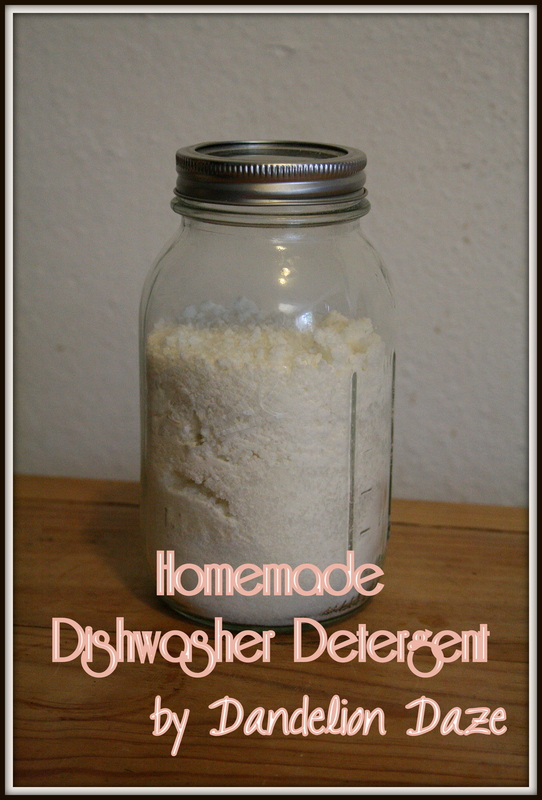 I decided that I would start with making my own dishwasher detergent. I made my recipe after combining a few recipes available from Crunchy Betty here and here. The reason I decided to start with my dishwasher detergent is two-fold. First, what we use to wash our dishes ultimately ends up in our mouths. Sure, it’s a pretty small amount but we still ingest it everyday. The second reason is kind of scary and a little late being that it happened about 3 years ago, but C actually ate part of a packet of commercial dishwasher detergent when he was about 15 months old. First things first, he was fine and had no harm whatsoever (except that he did throw it up) and second YES I had and still have child locks but he managed to get his little hand in the cupboard with the lock engaged while I was in another room. I came in and saw what happened and ran (literally RAN) to the phone and called Poison Control who scared me even more when they said the words “chemical burns”. We went to the ER and they checked him out right away. He was just fine, but the doc gave him a juice box and had us stay for about 45 minutes to make sure he kept it down. We went home and the first thing I did was move the detergent and anything else harmful from under the sink to a high shelf in the garage. Now, if I had even thought at the time that I could have made my own dishwasher detergent that would have been safe for my family I totally would have. I guess it just never occurred to me. And C isn’t going to be trying to munch on anymore dishwasher packets being that he’s 4 now but better late than never, I suppose. 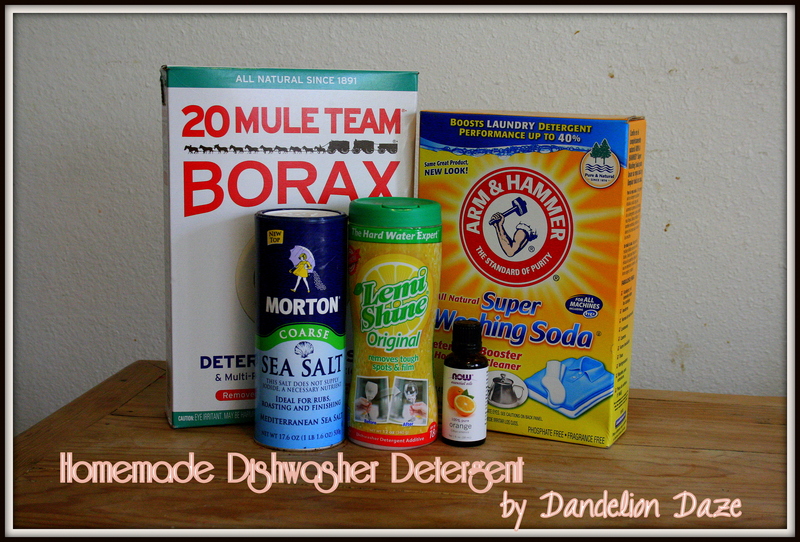 Homemade dishwasher detergent with 5 ingredients, that’s it!! Combine all ingredients in a container and there you go! You will want to add the essential oil several drops at a time and then stir it up really well after each addition. You’ll fill your wash compartment with it each time you run your dishwasher. 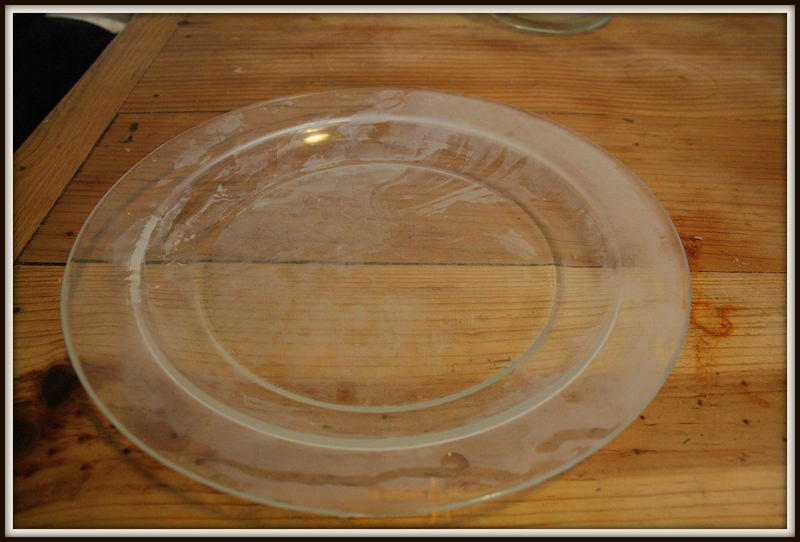 Also, fill your rinse well with white vinegar to help reduce film on your clean dishes. 1. As noted in the ingredients list, you can use citric acid in place of the Lemi Shine. 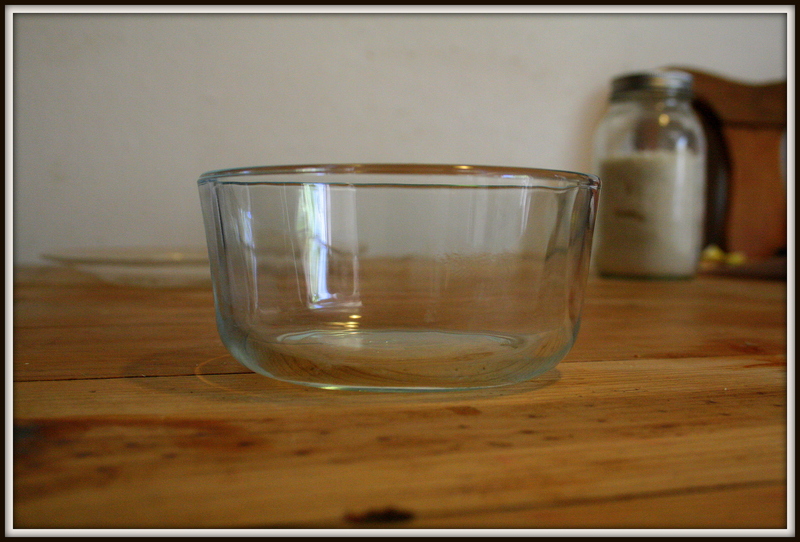 This is to reduce film on your dishes. Don’t skip it, you can see why in the photos near the end of this post. The only reason I didn’t use citric acid is because I couldn’t find it and I really didn’t want to have to pay for shipping by ordering online. But here’s the thing about Lemi Shine….they don’t tell you what’s in it. The bottle says that it is made with “real fruit acids and natural citrus oils”. So of course, I was skeptical of using it without doing some research first. I found this website which totally put my mind at ease, though. Basically a chemist had the same question I did, so he performed a bunch of tests on Lemi Shine. The results? It’s nearly identical to citric acid which we know is safe. Check out the website and the reports that have been posted there. 2. In my own detergent, the Lemi Shine makes it all clump together pretty badly. I’ve read similar reports with the citric acid, although I haven’t used it. As long as it’s all mixed up really well when you put all the ingredients together, it shouldn’t be an issue. I just scoop it out with a spoon and fill my wash compartment. So if you make this and then tomorrow it’s practically rock hard, that’s okay. It will still work just fine. 3. Is borax really safe? I’ve read so much in my research on homemade cleaning products about borax being toxic. It seems many people have it confused with boric acid which it is not. The best article I have come across that addresses this is again on Crunchy Betty. You can find it here. Check it out, read it for yourself and decide how you feel on using borax. I think it’s fine. Also, read this one about a little girl who ate homemade dishwasher detergent that is almost identical to my recipe (including the mysterious Lemi Shine!). She’s fine. Didn’t even have to go to the hospital, but still read it if you have any concerns about your little ones. Now, you’re probably wondering, how clean will my dishes look after I run my dishwasher? I have pictures! The first time I tried this, I didn’t use Lemi Shine or citric acid. Like I said before, I couldn’t find citric acid and I was wary of Lemi Shine. But when I saw what my dishes looked like, I knew I needed something which is what prompted all of my research on Lemi Shine. Yuck! Imagine my disappointment when I ended up with a full dishwasher looking like this! This is with the vinegar in the rinse well that I told you to use. But by itself, it just doesn’t cut it! So……in comes the Lemi Shine and the sparkly dishes! Now, I’m sure you have one more question. How much money does this save? A lot!! Okay, so that’s not a number. Well, the washing soda cost me about $4.50 for 55 oz at Ace Hardware. 76 oz of Borax was $3.50 and 12 oz of Lemi Shine was $3.66, both at Walmart. Salt I had on hand but I’d say it was probably about 2.50 for the 17.6 oz container and the essential oil was on sale for $3.50 for 1 oz at Sprouts. The most expensive ingredient was Lemi Shine, I used 8 oz of it in one batch which cost $2.44. I used 8 oz of Borax which would cost about $0.37 and the same amount of washing soda cost about $0.65! The essential oil was such a small amount, I’m not even sure how to calculate that. The salt would be a guess at about $0.60 for the 4 oz I used. So total cost for one batch is about $4.06. I’m going to have to update this post when I see how many loads one batch will wash. I have also made my own laundry detergent and fabric softener but that is post for another day!